Initially developed by Android Inc., which Google bought in 2005, Android was unveiled in 2007, with the first commercial Android device launched in September 2008. The operating system has since gone through multiple major releases, with the current version being 9 "Pie", released in August 2018. The core Android source code is known as Android Open Source Project (AOSP), and is primarily licensed under the Apache License. Android has been the best-selling OS worldwide on smartphones since 2011 and on tablets since 2013. As of May 2017[update], it has over two billion monthly active users, the largest installed base of any operating system, and as of June 2018, the Google Play store features over 3.3 million apps. 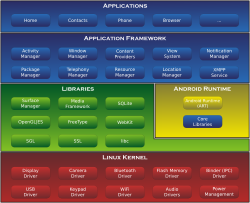 Android has a growing selection of third-party applications, which can be acquired by users by downloading and installing the application's APK (Android application package) file, or by downloading them using an application store program that allows users to install, update, and remove applications from their devices. Google Play Store is the primary application store installed on Android devices that comply with Google's compatibility requirements and license the Google Mobile Services software. Google Play Store allows users to browse, download and update applications published by Google and third-party developers; as of July 2013[update], there are more than one million applications available for Android in Play Store. As of July 2013[update], 50 billion applications have been installed. Some carriers offer direct carrier billing for Google Play application purchases, where the cost of the application is added to the user's monthly bill. As of May 2017, there are over one billion active users a month for Gmail, Android, Chrome, Google Play and Maps. In current versions of Android, "Toybox", a collection of command line utilities (mostly for use by apps, as Android doesn't provide a command line interface by default), is used (since the release of Marshmallow) replacing a similar "Toolbox" collection found in previous Android versions. Charts in this section provide breakdowns of Android versions, based on devices accessing the Google Play Store in a seven-day period ending on October 26, 2018. [lower-alpha 2] Therefore, these statistics exclude devices running various Android forks that do not access the Google Play Store, such as Amazon's Fire tablets. On October 16, 2018, Google announced that it would change its distribution model for Google Mobile Services in the EU, since part of its revenues streams for Android which came through use of Google Search and Chrome were now prohibited by the EU's ruling. While the core Android system remains free, OEMs in Europe would be required purchase a paid license to the core suite of Google applications, such as Gmail, Google Maps and the Google Play Sore. Google Search will be licensed separately, with an option to include Google Chrome at no additional cost atop Search. European OEMs are able to bundle third-party alternatives on phones and devices sold to customers, if they so choose. OEMs will no longer be barred from selling any device running incompatible versions of Android in Europe. ↑ "Android – Google Mobile Services". Android. Retrieved 2018-10-21. 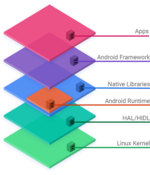 While the Android Open Source Project (AOSP) provides common, device-level functionalities such as email and calling, GMS is not part of AOSP. GMS is only available through a license with Google [..] We ask GMS partners to pass a simple compatibility test and adhere to our compatibility requirements for their Android devices. ↑ Jeffries, Adrianne (2013-03-19). "Disconnect: why Andy Rubin and Android called it quits". The Verge. Retrieved 2018-10-26. ↑ 15.0 15.1 15.2 15.3 15.4 Elgin, Ben (August 17, 2005). "Google Buys Android for Its Mobile Arsenal". Bloomberg Businessweek. Bloomberg L.P. Archived from the original on February 5, 2011. Retrieved March 12, 2017. ↑ 16.0 16.1 Alabaster, Jay (April 16, 2013). "Android founder: We aimed to make a camera OS". PC World. International Data Group. Archived from the original on May 10, 2017. Retrieved May 9, 2017. ↑ 20.0 20.1 20.2 Manjoo, Farhad (May 27, 2015). "A Murky Road Ahead for Android, Despite Market Dominance". The New York Times. Archived from the original on July 6, 2017. Retrieved March 12, 2017. ↑ 72.0 72.1 72.2 "Phones & Tablets". Android Developers. Google. Archived from the original on March 31, 2017. Retrieved March 12, 2017. ↑ 87.0 87.1 87.2 87.3 87.4 87.5 87.6 87.7 Amadeo, Ron (October 21, 2013). "Google's iron grip on Android: Controlling open source by any means necessary". Ars Technica. Condé Nast. Archived from the original on March 10, 2017. Retrieved March 11, 2017. ↑ 88.0 88.1 88.2 88.3 "Google mandates 'Powered by Android' branding on new devices". Geek.com. Archived from the original on March 28, 2014. Retrieved March 28, 2014. ↑ 91.0 91.1 91.2 "Android Compatibility". Android Developers. Google. Archived from the original on October 17, 2013. Retrieved November 16, 2013. ↑ 101.0 101.1 "Android Lollipop". Android Developers. Google. Archived from the original on January 30, 2017. Retrieved March 11, 2017. ↑ 105.0 105.1 Shah, Agam (December 1, 2011). "Google's Android 4.0 ported to x86 processors". Computerworld. International Data Group. Archived from the original on January 24, 2012. Retrieved March 11, 2017. ↑ 106.0 106.1 "Android on Intel Architecture". 01.org. July 11, 2013. Archived from the original on February 9, 2014. Retrieved February 9, 2014. ↑ 111.0 111.1 "Android Developers: Graphics". android.com. Archived from the original on October 10, 2014. Retrieved November 15, 2013. ↑ 129.0 129.1 "Building for devices". Android Open Source Project. Google. Archived from the original on January 7, 2012. Retrieved March 13, 2017. ↑ 135.0 135.1 135.2 Cunningham, Andrew (June 28, 2011). "What happened to the Android Update Alliance?". Ars Technica. Condé Nast. Archived from the original on March 12, 2017. Retrieved March 11, 2017. ↑ 140.0 140.1 140.2 Gillmor, Dan (October 28, 2012). "Android's smartphone OS upgrade issues need more than a quick fix". The Guardian. Guardian Media Group. Archived from the original on March 14, 2017. Retrieved March 13, 2017. ↑ 156.0 156.1 Kroah-Hartman, Greg (December 9, 2010). "Android and the Linux kernel community". Linux kernel monkey log. Retrieved June 20, 2017. ↑ 158.0 158.1 Paul, Ryan (February 24, 2009). "Dream(sheep++): A developer's introduction to Google Android". Ars Technica. Condé Nast. Archived from the original on July 4, 2017. Retrieved June 20, 2017. ↑ 172.0 172.1 Paul, Ryan (February 24, 2009). "Dream(sheep++): A developer's introduction to Google Android". Ars Technica. Condé Nast. Archived from the original on March 12, 2017. Retrieved March 11, 2017. ↑ 178.0 178.1 Burnette, Ed (June 4, 2008). "Patrick Brady dissects Android". ZDNet. CBS Interactive. Archived from the original on July 5, 2017. Retrieved March 11, 2017. ↑ 179.0 179.1 179.2 Amadeo, Ron (January 6, 2012). "Android N switches to OpenJDK, Google tells Oracle it is protected by the GPL". Ars Technica. Condé Nast. Archived from the original on March 12, 2017. Retrieved March 11, 2017. ↑ 180.0 180.1 "Google confirms next Android version won't implement Oracle's proprietary Java APIs". VentureBeat. Archived from the original on December 30, 2015. Retrieved December 30, 2015. ↑ 191.0 191.1 191.2 "HTC's bootloader unlock page". Htcdev.com. Archived from the original on October 19, 2012. Retrieved September 15, 2012. ↑ 199.0 199.1 199.2 James Ball. "Angry Birds and 'leaky' phone apps targeted by NSA and GCHQ for user data | World news". theguardian.com. Archived from the original on March 2, 2014. Retrieved February 2, 2014. ↑ 204.0 204.1 "Mobile malware exaggerated by "charlatan" vendors, says Google engineer". PC Advisor. November 24, 2011. Archived from the original on March 8, 2013. Retrieved November 9, 2012. ↑ 205.0 205.1 Hildenbrand, Jerry (November 2, 2012). "Android 4.2 brings new security features to scan sideloaded apps". Android Central. Mobile Nations. Archived from the original on April 8, 2017. Retrieved March 11, 2017. ↑ 269.0 269.1 269.2 Brodkin, Jon (November 5, 2012). "On its 5th birthday, 5 things we love about Android". Ars Technica. Condé Nast. Archived from the original on March 12, 2017. Retrieved March 11, 2017. ↑ 276.0 276.1 Arthur, Charles (July 30, 2013). "Android fragmentation 'worse than ever' – but OpenSignal says that's good". The Guardian. Archived from the original on August 1, 2013. Retrieved August 1, 2013. ↑ 285.0 285.1 "Android Marks Fourth Anniversary Since Launch with 75.0% Market Share in Third Quarter, According to IDC – prUS23771812". Idc.com. Archived from the original on November 3, 2012. Retrieved November 3, 2012. ↑ 286.0 286.1 Kumparak, Greg (July 14, 2011). "Android Now Seeing 550,000 Activations Per Day". TechCrunch. AOL. Archived from the original on July 7, 2017. Retrieved June 25, 2017. ↑ 290.0 290.1 Melanson, Donald (April 16, 2013). "Eric Schmidt: Google now at 1.5 million Android activations per day". Engadget. AOL. Archived from the original on March 12, 2017. Retrieved March 11, 2017. ↑ 304.0 304.1 Lua error: Internal error: The interpreter has terminated with signal "24". ↑ 307.0 307.1 Lua error: Internal error: The interpreter has terminated with signal "24". ↑ 335.0 335.1 335.2 335.3 Lua error: Internal error: The interpreter has terminated with signal "24". 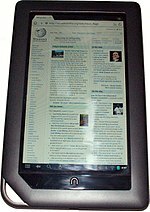 Damon Poeter (December 27, 2012) "Non-Apple Tablets Making Small Gains on iPad" PC Magazine Lua error: Internal error: The interpreter has terminated with signal "24". Matt Hartley (December 24 2011) "Massacre of the Tablets" Financial Post Lua error: Internal error: The interpreter has terminated with signal "24". ↑ 379.0 379.1 Lua error: Internal error: The interpreter has terminated with signal "24". ↑ 397.0 397.1 Lua error: Internal error: The interpreter has terminated with signal "24". ↑ 403.0 403.1 Lua error: Internal error: The interpreter has terminated with signal "24". ↑ 433.0 433.1 Lua error: Internal error: The interpreter has terminated with signal "24". Template:Android Lua error: Internal error: The interpreter has terminated with signal "24". Lua error: Internal error: The interpreter has terminated with signal "24". Lua error: Internal error: The interpreter has terminated with signal "24". Lua error: Internal error: The interpreter has terminated with signal "24". Lua error: Internal error: The interpreter has terminated with signal "24". Lua error: Internal error: The interpreter has terminated with signal "24".Lua error: Internal error: The interpreter has terminated with signal "24".